Snowstorms have been walloping [R226R, Mt. Baker Ski Area] in Washington. In 10 days, just shy of 12 feet of snow piled up at the ski area and a monster sidecountry avalanche ripped down neighboring Shuksan Arm. Last week, storms and a deepening unstable snowpack forced Mt. Baker to close for two days. Fallen trees shut down the access highway, and the avalanche danger skyrocketed to the point where resort officials opted to remain closed even after the highway reopened. By Friday, March 16, lifts were running at the resort again with skiers and riders diving through powder. 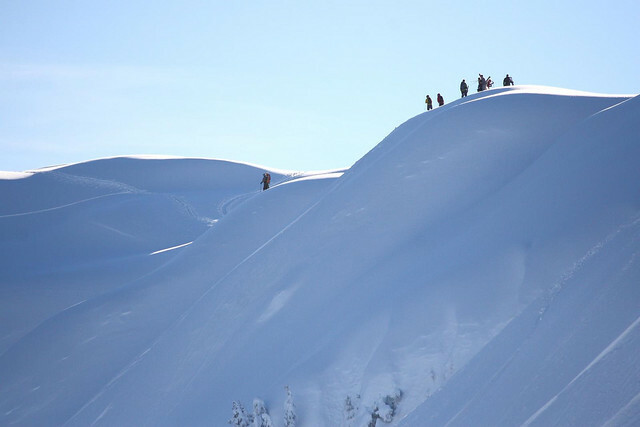 Skiers and snowboarders line up atop Shuksan Arm Ridge, ready to drop into the basin, the same location as the avalanhe last week. Photo by Judd Hall/Flickr. Due to the closure of the ski area, no one was hurt. According to NWAC, the general manager of Mt. Baker labeled the avalanche as the biggest one seen in his 40 years of work at the ski area. NWAC also reported the avalanche crown was estimated at 15 feet high, and the trees the slide knocked down were two feet in diameter. The area where the avalanche occurred is popular with backcountry skiers at Mt. Baker. Using Chair 8 helps gain vertical to begin climbing Shuksan Arm. Mt. Baker may well be on to a record-breaking March for snowfall. As of this week, 190 inches have fallen at the ski area so far in March with more snowstorms pelting the mountain. Last year, a banner year for snow across the West, saw 227 inches of snowfall in March, but this year’s warmer and wetter weather pattern could surpass that. The ski area is on track to hit its annual average snowfall of 701 inches by the end of March with much of the spring season still remaining. Due to the deep snowpack, the resort has issued several advisories, recommending above all that skiers and riders go with a partner. The snowpack at Pan Dome is more than 25 feet deep. In addition to deep snow tree well hazards, schrunds are appearing in some of the steep black diamond areas. Schrunds are gaps where the snow pulls away from steep rock faces. Mt. Baker Ski Area plans to operate daily through April 8 and Fridays through Sundays after that through the end of April.